Mullets are an 80s hair fad. Does the proliferation of mullet hair sites mean that the mullet is making a comeback? Maybe yes. Maybe no. Some of the sites are an ode to the older version of the style. Men and women wore the mullet mostly in the 1980s, and the style is supposedly named after a fish popular in southern states. One theory around the association of this fish with the hairstyle states that fishermen wore their hair long in the back to keep their necks warm. The mullet fad ended almost as abruptly as the fad began, and like neon colors, jelly shoes, and big hair, it is possible that eighties fans, nostalgic about this era, are creating sites about this 80s hair style to remember good times, or maybe even rekindle a laugh at the style with the rest of the world. Most sites about mullets focus on a fascination of celebrities wearing the style. Photos of the celebrities sporting mullets and lists of celebrities who wore mullets are topics of interests on these mullet-focused web sites. 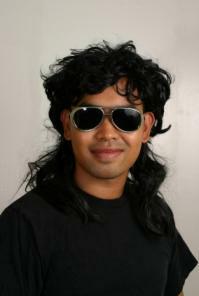 One of the most unusual websites about mullets, The Plague of the Mullet focuses on the history of the mullet. The creators of this site have found photos of people wearing mullets throughout history, proving that the style comes and goes. People tend to love the style and then hate it ferociously. Compared to other sites that discuss the mullet as only existing in the 1980s, this site digs deeper, showing us that the style existed far before the 1980s punk rock craze. Current mullet hair sites also include trends related to the comeback of the site as mentioned before. The reverse mullet is in vogue. In this style the hair is longer in the front and shorter in the back. In fact, by looking closely, it is possible to find a mullet style in several current popular styles that are shone on web sites. The difference is that most stylish cuts today are not obvious mullets. The hair may be shorter in top and longer in the back, but it is usually layered or angled in such a way, that the differences in lengths are not as abrupt as in the old retro mullet. Mullet hair sites can show you a glimpse of the mullet's past popularity. Since many hair trends come and go, it is possible that these sites may also be a hint of what style trends can reappear.